The following article appears in the 2006–2007 issue of Aero-Astro, the annual report/magazine of the MIT Aeronautics and Astronautics Department. © 2007 Massachusetts Institute of Technology. While originally conceived to make a substantial reduction in airplane noise, MIT-Cambridge University silent aircraft design could achieve 124 passenger-miles per gallon, almost 25 percent more than current aircraft. Aimed at the 2030 time frame, some of the quiet technologies the MI-Cambridge team developed could be incorporated sooner. The Silent Aircraft Initiative was created to meet the challenge of further reducing aircraft noise the in face of ever-increasing aircraft operations. The approach was to make radical reduction in noise a primary design criterion. The project goal was design of an aircraft quiet enough to be imperceptible to people in the urban environment around airports while being competitive with existing and next generation aircraft fuel burn and emissions. 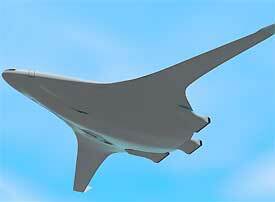 A key project outcome was the conceptual “Silent Aircraft eXperimental” design SAX-40. The aircraft has an estimated noise level less than the background noise of a well-populated area and a predicted 23% fuel burn reduction compared to current civil aircraft. SAI aimed to take a major step beyond aviation industry’s noise reduction targets, a target that would call for a highly integrated airframe and engines, as well as operations and design co-optimized for low noise. This ambitious goal would necessitate involving a range of partners from academia, industry, and government; a collaboration among organizations and individuals with different skills and interests. For example, the project would include research into airframe and engine design and ways to reduce noise by changing takeoff and approach procedures. There would be an economic assessment of regulatory scenarios under which the aircraft would present an attractive business case to an airline and determine national and local economic benefits. SAI is one of the Cambridge (University)-MIT Institute’s Knowledge Integration Communities (KICs); research communities exploring ways for academia, industry, and government to work together. The KIC fosters linkages and two-way flows of information between academic researchers and their colleagues in commerce, enhancing the impact of the research. The SAI community comprised airframers, engine manufacturers, airport and airline operators, air traffic controllers, regulators and measurement specialists at over thirty partners, in addition to the academics. We designed for an aircraft mission of 215 passengers with a range of 5000 Nm at a cruise Mach number of 0.8. The conceptual design’s airframe differs radically from current civil aircraft. There are conventional supercritical wings, but the fuselage is a lifting body, aerodynamically shaped to achieve enhanced low speed and cruise performance without the need for flaps and a tail. The design parameter Mach number times lift/drag ratio is 20; for reference the Boeing Phantom Works Blended Wing Body has 17-18. The wing span is 222 feet (67.5 m) including the winglet, and the maximum takeoff weight is 332,000 lbs (151,000 kg). The conceptual design airframe differs radically from current civil aircraft. 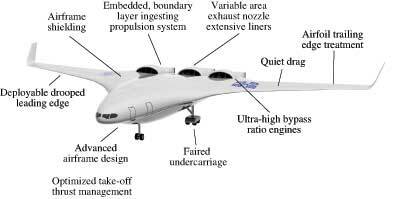 There are conventional supercritical wings, but the fuselage is a lifting body, aerodynamically shaped to achieve enhanced low speed and cruise performance without the need for conventional flaps and a tail. The aircraft is propelled by a distributed high bypass ratio propulsion system (cruise bypass ratio of 12) embedded in the fuselage. There are nine geared fans driven by three gas generators. Each inlet feeds air to one engine cluster comprised of a turbofan and two auxiliary fans. For the concept aircraft the community noise levels are estimated not to exceed 63 dBA for typical missions, comparable to the background noise in urban daytime environments. Asubstantial reduction (75 dB in cumulative Effective Perceived Noise for sideline, takeoff, and approach) is estimated relative to the current International Civil Aviation Organization (ICAO) noise standard. There is a major fuel saving predicted relative to current civil aircraft: 124 passenger-miles per (US) gallon compared to 101 passenger-miles per gallon for a Boeing 777, a 23% increase. For reference, the Toyota Prius hybrid car carrying two passengers is reported as having a city-highway fuel burn of 96 passenger-miles per gallon. It is expected that further fuel efficiency, even with respect to this major saving, could be achieved in an aircraft design specifically targeted to minimize fuel consumption and emissions. Low noise is not achieved by a single design feature. It results from many disciplines integrated into the design and operation of a noise-minimizing aircraft system. Many of these design features are also reduce fuel burn and emissions. Low noise approach operations: On approach, the airframe generates half the noise and the noise sources strongly scale with the flight velocity. Substantial noise reductions can thus be achieved by using a low speed approach and a displaced runway threshold on landing, thereby increasing distance to listeners on the ground. Efficient airframe centerbody design: The leading edge region of the centerbody is aerodynamically shaped to balance aerodynamic moments for pitch trim and to provide static stability without a tail. At cruise conditions, the all-lifting airframe is calculated to achieve an elliptical span load distribution, improving the Mach number times lift/drag ratio parameter by 15% compared to current blended-wing body type aircraft designs. The enhanced low speed airframe performance allows stall speed reduction by 25% compared to current aircraft of similar size. Airfoil trailing edge treatment: Trailing edge brushes have been found to reduce the scattering noise from turbulence near the trailing edges. The estimated trailing edge noise reduction is 4 dBA. Faired undercarriage: The undercarriage noise sources can be mitigated by partially enclosing wheels and axles. Estimated noise reduction from use of fairings is roughly 6 dBA. Deployable, drooped leading edge: A deployable drooped leading edge can provide the required lift during low speed operations without the use of slats, thus eliminating slat noise. The drooped leading edge is stowed at cruise. Deployment power levels are comparable to a conventional slat. The Airbus A380 uses this configuration. Quiet drag (needed on approach) via increased induced drag: Large wing area and high angle of attack provide the lift at low speed without using deployable flaps, eliminating a major source of airframe noise on takeoff and landing. A combination of elevons and thrust vectoring can increase the induced drag to the required level, while trimming the aircraft. Embedded, aircraft boundary layer ingesting, distributed propulsion system: Ingestion of fuselage boundary layer air into the engine allows a potential reduced fuel burn. There is a trade between this gain and the losses due to the increased duct length needed for noise attenuation. Embedding the engines within the airframe implies a high degree of airframe and engine integration. Engine airflow is now affected by the airframe and, similarly, the presence of the engines alters the flow around the aircraft. There are several major challenges, associated with the non-uniform flow into the engine (distortion), which must be addressed for a practical aircraft configuration. Unlike most civil aircraft today, which have their engines mounted externally, the silent aircraft’s engines are embedded in the fuselage. There are nine geared fans driven by three gas generators. Each inlet feeds air to one engine cluster comprising a turbofan and two auxiliary fans. Variable area exhaust nozzle to permit ultra-high bypass ratio, low fan pressure ratio, engines: To reduce the engine noise at takeoff the engine exhaust velocity must be decreased. 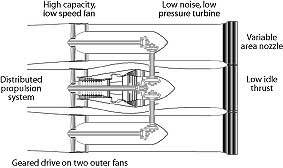 To ensure fan operability at the low power needed for low exhaust velocity the exhaust nozzle is designed to have variable area, with takeoff bypass ratio of 18, and cruise bypass ratio of 12. The low engine rotational speed during approach enabled by the variable nozzle reduces the rearward fan noise and the airframe drag requirements. The fan design, however, must now accommodate the broad range of flows associated with operation of low pressure ratio fans at different flight conditions. Airframe shielding of engine noise: Placing the engines above the airframe prevents engine noise from reaching the observer. Engine forward radiated noise is virtually eradicated on the ground. Optimized takeoff thrust management: Thrust, climb angle, and nozzle area would be continuously varied during takeoff to maintain a set noise level outside the airport boundary. This would allow the specified noise level to be met at all times during departure. Optimized extensive liners: The embedded propulsion system allows smaller engine diameter and thus increased non-dimensional (length/diameter) duct length. The longer inlet and exit ducts provide scope to further reduce engine noise by allowing additional acoustic liners, compared to conventional nacelles, to absorb the engine noise. In the design configuration, use of an optimized multi-segment liner design results in an estimated 20 dBA reduction of engine noise. 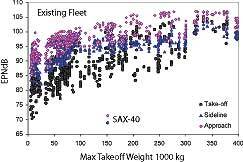 This chart compares the effective perceived noise level of current commercial aircraft with the dramatically lower level for the SAX-40 (silent aircraft). For the SAX-40, the community noise levels are estimated not to exceed 63 dBA for typical missions, which is comparable to the background noise in urban daytime environments. A range of skills and interests beyond those of the two universities were needed to tackle the many challenges, necessitating a collaboration that included regulators, airport operators, airlines, aerospace manufacturers and representatives of community groups. SAI has been an instructive and useful experiment in academic-industry interactions on several levels — from strategic planning and decisions (input from the KIC members had a direct impact on the project goals) to detailed working level technical interchange. Formal meetings of all the partners in the Knowledge Integration Community occurred at roughly eight month intervals, but interaction with some partners was more frequent. Industrial partners gave the academic researchers access to some of their in-house design codes. Boeing, Rolls-Royce, NASA, and ITP conducted reviews and provided feedback on the designs. For example, Boeing made available its Multidisciplinary Design Optimization code, WingMOD, which optimizes the aircraft planform for a given mission. Rolls-Royce allowed use of the company’s design, performance, and noise evaluation tools to examine concepts for potential new engine designs. An academic team project that is carried out as part of student degree programs contains a set of goals that creates a tension in the overall conduct of the project. Each student needs to develop the new ideas that comprise their thesis in order to get their degree, and these need to be visible as a contribution that the particular student has made. However, there is also a need for the research results to be integrated into a workable design concept. There must thus be a clear, mutual, and explicit understanding of the advisor and student as to what the expected intellectual contribution for the thesis will be and how it will be consistent with participation in the overall design. Beyond the above discussions, however, processes were needed to ensure productive collaboration of the large research group into an integrated product team. This implies such a vital need for effective communication and information exchange and the ability to make strategic decisions, sometimes based on limited available information. Weekly videoconferences, and even more frequent email and telephone contact, were essential for the former aspect of the design integration, but, in industry, a chief engineer would deal with the latter type of issues. As the different pieces of the research started to come together and progress was made on the component designs, it became evident that such a function would also be of great value on the project. A faculty member and a post doctoral associate were assigned, and shared effectively, the role of co-chief engineers. Finally, there were issues for which team members formed ad hoc task forces to address design decisions at crucial stages of the project. Examples of specific questions addressed in this manner are “What should be the design range?” and “Should the engines be podded or embedded?” The task forces were several week-long focused activities, drawing on members from all the relevant aspects of the research and involving exchanges of personnel. This last helped to build the working relationships and also diffuse “we-they” perspectives. While collaboration was essential throughout the project, it was perhaps most critical in the area of aircraft operations, in which the team in Operations worked to develop an advanced form of Continuous Descent Approach for current aircraft. CDA is a procedure enabling aircraft to make a single continuous descent from altitude to landing, rather than the current procedure which involves a series of descent “steps.” It reduces noise levels on the ground along the approach path while also reducing fuel burn. CDA is now in trials at Nottingham East Midlands Airport. Putting the new procedures in place was a many-step task that required agreements between air traffic controllers, regulators, suppliers, airport operators, and airlines; it is an example of something that could not have been achieved without this type of partnership. In summary, the silent aircraft project brought industry, academia, and other stakeholders together around a “grand challenge” which captured the enthusiasm and imagination of all those involved. The Knowledge Integration Community includes industry, government, and academi,a and provides an exciting way to address problems with a large reach, underpinning the vital nature of collaboration in achieving the potential for step-change improvements. As well as the conceptual design of a new type of aircraft, some of the technologies developed could be introduced into more incremental aircraft and engine designs. Collaboration and teaming occurred in basically all aspects of the project and, because of this, SAI has been very much an enterprise in which the whole is greater than the sum of the separate parts. Dame Ann Dowling is Professor and Head of Division in the Cambridge University Engineering Department and was the Cambridge lead for the silent aircraft project. Edward Greitzer is the H. N. Slater Professor and Deputy Department Head of the MIT Aeronautics and Astronautics Department and was the MIT lead. Thomas Hynes is a senior lecturer in the Cambridge University Engineering Department and was head of the engine team. James Hileman and Zoltan Spakovszky are a research engineer and pssociate professor, respectively, in the Aero-Astro Department, and were the two project co-chief engineers.